There was a question and answer session after my seminar in Melbourne and what I found so interesting is how everybody seems to be embracing the eclectic vibe – I had thought it was more of a European thing but wrong I was. Its hard to achieve teaming seemingly disparate objects together so they make perfect sense and yet once you start its super addictive. Its also a look that doesn’t require one to have oodles of money – teaming flea markets finds with some modern or mass market find is pretty much the name of the game.Â Take art for instance, nothing transforms the personality of walls like art – bringing a space alive, adding texture, colour and a huge dose of personality. If your budget isn’t huge rather than hanging art as a stand alone piece consider clustering en masse. This does two things it distracts from the fact you are hanging merely prints, etsy or eBay purchases but more importantly it adds a visual friction a tension if you like and I’m all for adding tension – just ask Graham! 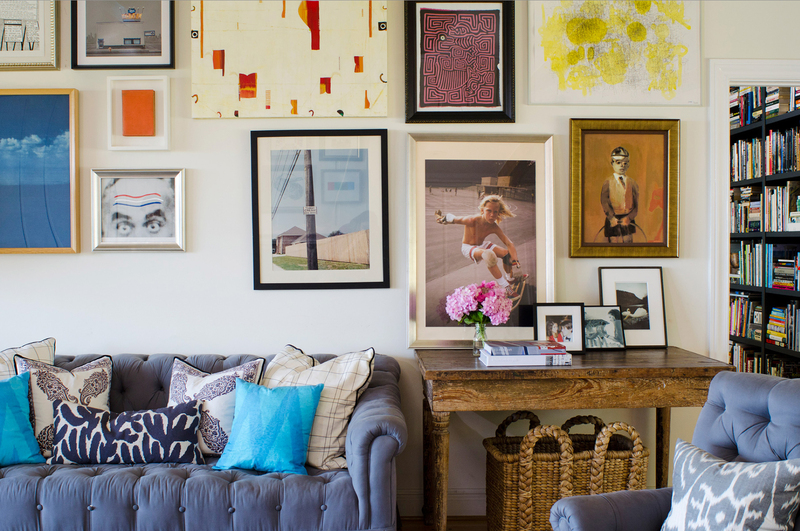 Minnie Mortimer’s pad in Malibu was featured in Vogue recently and whilst I am sure her art wasn’t cheap as chips andÂ purchased from flea markets – she’s pretty much nailed what I am talking about as far as mixing it up goes. None of it matchesÂ BUT YET when you look at is a whole installation it makes sense. Its an impromtu arrangement, there isn’t a grid system of any system come to that its just simplyÂ hung. My point being it makes the space super relaxed you don’t feel as if you are in a museum or some hoity toity pad where you don’t even want to sit down. It feels personal and totally unique to the space. As I mentioned the other day what is so exciting in interiors right now is literally anything goes – break rules, change rules, mix and match.Â Do that and you end up with a space that you can’t stand to leave every morning – I know that’s pretty much how I feel.